I made a few seasonal decorations just before Christmas. There was paper folding/origami stars and pom pom making together with a few Christmas cards. I made a fabric basket to give to a friend for her birthday which is on Christmas Day. I couldn’t show and tell on here as she may have seen it before she unwrapped it! The fabric I had saved in my stash for a long time – it had been waiting to be turned into something special. I am hoping she may use it to store some of her own craft things. The yarn you see was part of her Christmas present so perhaps a bit of a hint there! That basket turned out great! What a great use for special fabric 🙂 And your cards are cute as well – you were busy for the holidays! Thank you. I did a lot before Christmas but haven’t done much yet in 2019, or not as much as I should. 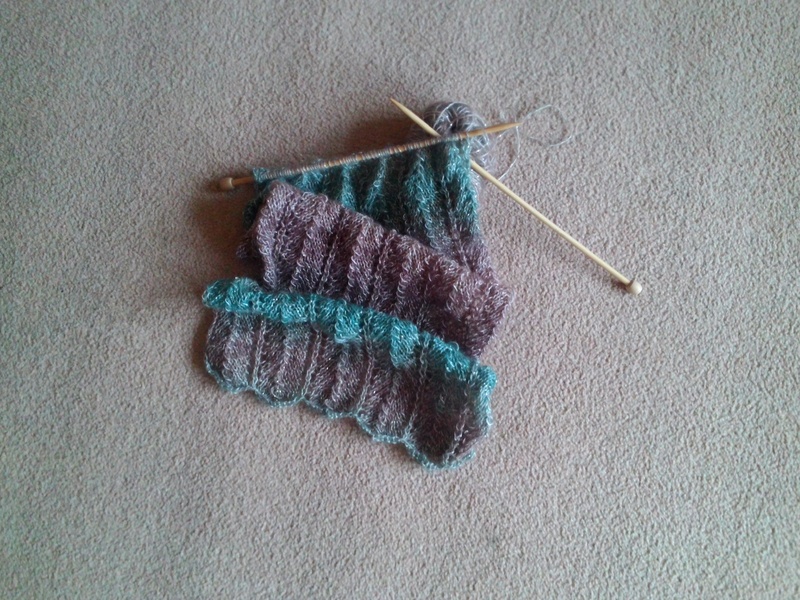 I am knitting a baby cardigan (not shown here yet) and am glad the baby hasn’t actually arrived yet!